At Fertility Solutions, we pride ourselves on being patient focused and are always looking for ways to make fertility treatments easier and more accessible. That’s why we now offer patients Bulk-Billed* IVF and FET cycles. Whilst the cycles themselves are bulk billed, it is important to be aware that eligible patients will have some out of pocket expenses for our Bulk-Billed* IVF and FET cycles. Not all patients will be eligible to access the Bulk-Billed* treatments and this will be determined by your doctor who will assess your individual circumstances. You must have access to Medicare Rebates to be able to access this service. It is also important to understand that the way these treatments are managed may mean that they are not suitable for all however, they do provide patients with another option to consider. 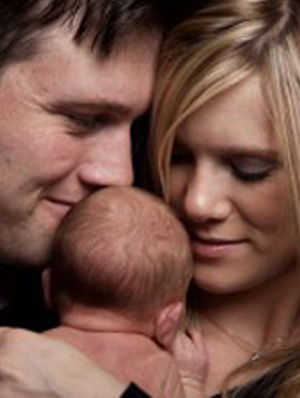 This approach could be considered as an introduction to IVF and is as much a diagnosis as it is a treatment. Click here for more information on the various levels of IVF treatments offered at Fertility Solutions and what they include. Note: Bulk Bill IVF treatments are not currently offered for patients with complex fertility concerns, such as those requiring donor eggs or sperm, PGD (genetic testing of embryos) or treatments requiring surgical sperm collections, these can be accessed through our customised IVF treatment option. To be eligible both patients must have access to Medicare rebates. Bulk Billed* Treatments are accessible at the Sunshine Coast and Bundaberg clinics. When making a specialist appointment you need to tell the receptionist that it is for Bulk Bill Fertility Treatment. If you have had treatment with Fertility Solutions let the receptionist know when making your appointment so that they can contact the clinic to request copies of test results. You will need a referral from your GP, one for you and a separate one for your partner to see one of our specialists. You will see the same doctor for your cycle planning and follow up appointments. *Only the IVF or Frozen Embryo Transfer (FET) cycles are bulk billed. There will be additional out of pocket expenses which may include services that are unable to be bulk billed through Medicare, such as a clinic fee, some medications, dispensing of medications, day surgery fees if hospital admission is required, some laboratory procedures and a small number of pathology tests. Most clinic communication with patients will be via email. Only patients using fresh or frozen ejaculated sperm can access this treatment (not suitable for people using sperm retrieved from testes – fresh or frozen, patients wanting to use donor sperm or eggs or other advanced laboratory procedures such as PICSI, assisted hatching and PGS/PGD). The model is based on patients having their egg collection at the Sunshine Coast clinic under conscious sedation. If patient has private health insurance or wish to pay the additional expenses associated with a hospital procedure this can occur. Patients accessing bulk bill IVF at the Bundaberg clinic can only have a hospital egg collection. The clinic has a set maximum number of follicles for a conscious sedation egg collection at the clinic to proceed. If this number is exceeded then options are to continue with cycle and have a hospital egg collection or cancel cycle and recommence on lower dose of medication (not preferred). ICSI using fresh or frozen ejaculated partner sperm can be used with this approach and will be at an additional cost. If fertilisation occurs then an embryo transfer will occur in 2-3 days after the egg collection. All remaining embryos will be cultured and any suitable frozen on day 5/6. Culturing of embryos to day 5 will be free but there is a cost for freezing and initial 3 months storage. There will also be ongoing costs every 6 months whilst embryos remain in storage. You do not have to have your embryos created in a Bulk Billed IVF cycle to access a Bulk Billed FET cycle. You can have embryos transferred from another clinic and access the Bulk Bill FET treatment. Embryos stored at Sunshine Coast clinic can be transferred to our Bundaberg clinic (please ask us re transportation costs). You can access Bulk Bill FET cycles using embryos created with donor sperm or eggs (conditions apply please call clinic for more information). You can choose any one of our specialists from the Buderim or Bundaberg clinics. This specialist will be the same doctor you see for your cycle planning and follow up appointment. Nurse manages the cycle, performs the scans and the embryo transfer. If your cycle is unsuccessful you can chose to have another Bulk Bill FET treatment with no change to the cycle or consider one of our other FET cycles approaches. Fertility Solutions offers all patients a $0 upfront no financial commitment consultation with a Fertility Nurse via the phone, Skype or at the clinic. 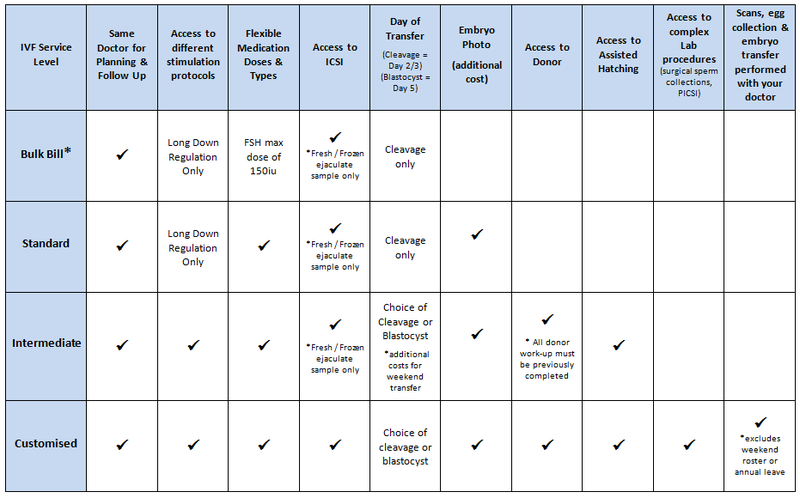 Click to view our IVF and FET Service Options Comparison Charts. *It is important to note there are some services associated with IVF and FET cycles that are unable to be bulk billed through Medicare, which includes some medications, dispensing of medication, day surgery/clinic fees, some laboratory procedures and a small number of pathology tests. We will discuss and provide cost estimates to ensure patients fully understand any additional costs that may be relevant BEFORE their treatment commences.